IMMACULATE CONDITION THROUGHOUT! Michael Anthony are pleased to offer this extremely well presented three bedroom semi detached family home. The propert has undergone extensive refurbishment and is a real credit to the current owners. 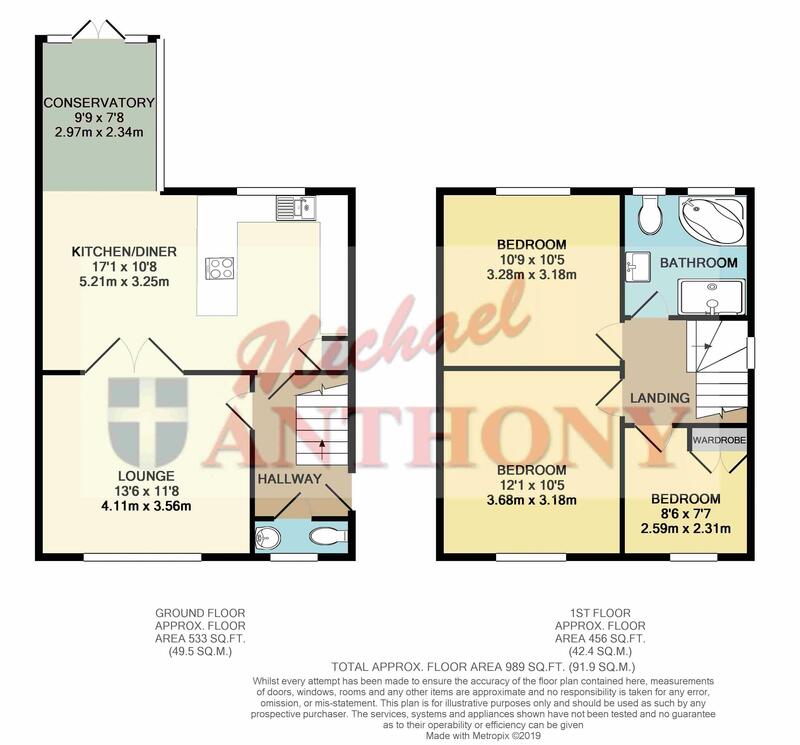 Accomodation comprises; Entrance hall, cloakroom, lounge, refitted kitchen/diner, refitted four piece bethroom suite, south facing rear garden. Call 01296 433666 for further information or to arrange a viewing. UPVC double glazed front door opens to entrance hall. Stairs to first floor, inset spotlight, porcelain tiled flooring, doors to all rooms. Frosted UPVC window to front aspect. Low level w.c. wash hand basin with mixer tap, radiator, inset spotlights, extractor fan, porcelain tiled flooring. UPVC double glazed window to front aspect. Radiator, television point, double doors open to kitchen/diner. UPVC double glazed window to rear aspect. Range of base and eye level units with roll top work surface, one and a half bowl sink unit with mixer tap, integrated fridge/freezer and dishwasher, space for washing machine, built in oven and microwave, fitted induction hob with extractor fan over, radiator, inset spotlights, porcelain tiled flooring, opens to conservatory. UPVC double glazed french doors open to rear garden, television point, porcelain tiled flooring. Frosted UPVC double glazed window to side aspect, access to loft space, inset spotlights, doors to all rooms. UPVC double glazed window to front aspect. Radiator, television point. UPVC double glazed window to front aspect. Radiator, built in wardrobe. Frosted UPVC double glazed window to rear aspect. n Four piece suite comprising low level w.c. wash hand basin with mixer tap in vanity unit, corner style bath, double shower, heated chrome towel rail, inset spotlights, extractor fan, part tiled walls. Block paving and shingle area providing parking for several vehicles leading to single garage with electric roller door, gated access to rear garden. South facing rear garden, enclosed by timber fencing, patio area, gated side access.